It’s dark. We wait inside a village hall peering out a small window overlooking a car park. The car park is empty except for a lone Volvo. Cars arrive, parking in a semicircle facing the Volvo. They are asked to tune their radios to a certain frequency. The lights go out. We step outside, our breath forming misty clouds in the bitter cold. The stars shine above in a vast cosmic canopy; somewhere, up there, is a comet. The tip of a orange moon can be seen rising above the low clouds on the horizon, reflecting on a calm sea which goes on forever. We wait in the shadows, unseen. The music starts. Blue lights illuminate. The sound of lapping waves and a fog horn of a ship echo as the open Shetland road is projected on to the Volvo. The sounds come through the car radios and the audience wait, enchanted, listening, watching. The doors of the Volvo slowly open and slam shut, three times. Breathe, one.. two.. three.. four.. five.. go. 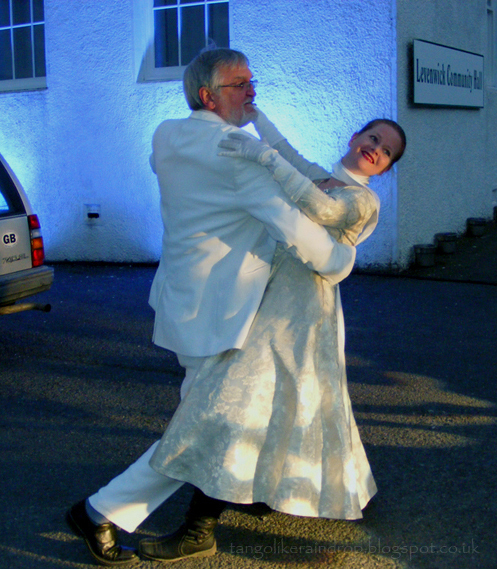 Two pairs of white-clad ballroom dancers emerge from the darkness on either side of the car, waltzing across the tarmac and back again like white, shimmering, fluttering birds. We disappear into the shadows again and wait. The car doors open and a group of ten youths emerge and begin to parkour around and across the car. Slow, graceful, athletic movements. We wait, swaying to the music, trying to keep warm. The parkour boys disappear into the car again. We dancers stroll, arm in arm, around the car. Meandering, gazing at the sky, the stars, trying to find the comet. The full moon has risen. The air is crisp, clear, invigorating. We dance. The upbeat tempo of the music providing us with an easy swaying step. We smile. We laugh. We savour every moment. 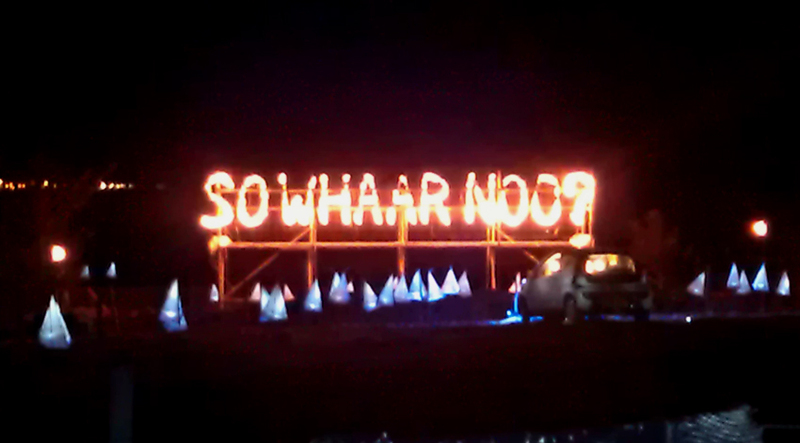 The parkour boys are brightly illuminated from within the car, partying, clearly going somewhere. There is a mass exit of the car and they stand on top, “posing” for theatrical photos; “car pictures”. Our partners take our hands and we briskly, joyfully swirl into the car, it is now our turn to ‘go somewhere’, to have our car journey. Our gentleman partners exit the car, open the our doors and take our hands as we step out of the beat up Volvo. We glide to the corners of the car and we dance. The parkour boys leave the stage except for one. He remains sitting in the back seat of the car, door open, feet on the ground outside. A change of music, an old time classic. We quickstep across the car park while the young man watches us, intently. We leave the ‘stage’ arm in arm, and stroll around the parked cars of the audience. Sometimes we stop and dance, sometimes we flit by the windows, ghostly, romantic, fleeting. 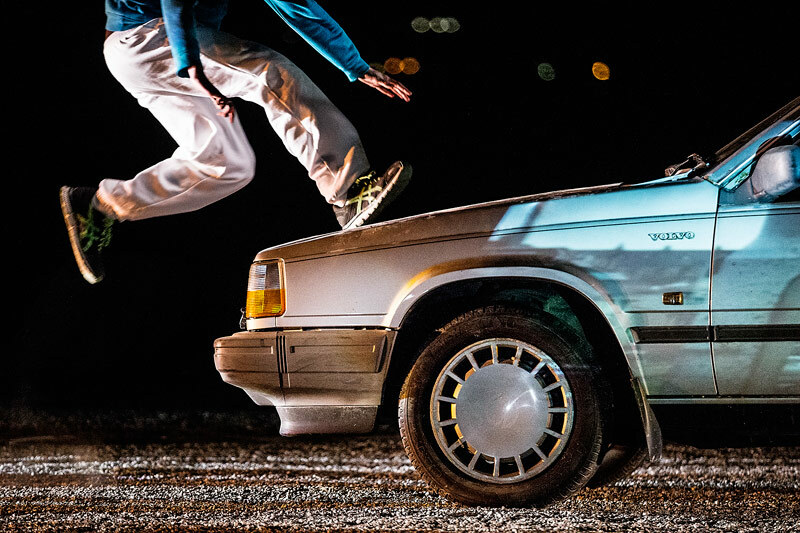 The parkour boys return to the Volvo and parkour in/on/around it, the very manifestation of youth, energy and passion. The parkour boys run to the corners of the car park and jog on the spot. We join them. Waiting, laughing, expectant. The music intensifies – something is going to happen. The music builds to a crescendo and the parkour boys run to the car, jumping, leaping, flipping, soaring. I grab my dance partner’s hand and we too run to the car, and we jive. We twirl, we laugh and smile and we dance. Then the music slows. The parkour boys disappear off stage, dispersing amongst the audience cars. …Oh I liked the dancing. I did like the dancing…. Louis Armstrong’s La vie en rose plays. We dancers have the stage to ourselves. Stand, ready… and go. We dance the Glen Roy foxtrot across the car park. Back and forth until the music and lights fade. We disappear, dancing off into the night while the parkour boys return for their finale. 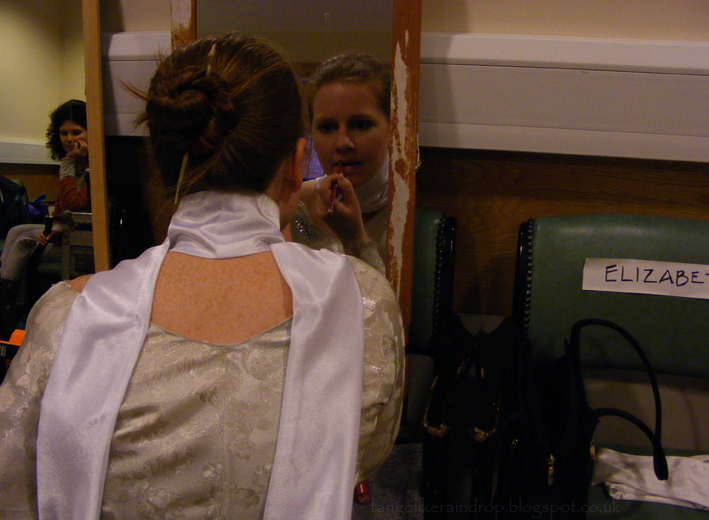 The project was spurred by the tragic loss of a young youth theatre member on the roads of Shetland in November 2007. The family hope that the project will raise awareness of road safety. It has certainly had me thinking of my own relationship with the road. I’ve traveled many a mile, have had many an adventure (some good, some bad) but I’ve only had a driving license for 18 months. I wouldn’t have been able to participate in this project had I not finally bitten the bullet and learned how to drive. There have been many different aspects to this six month project. 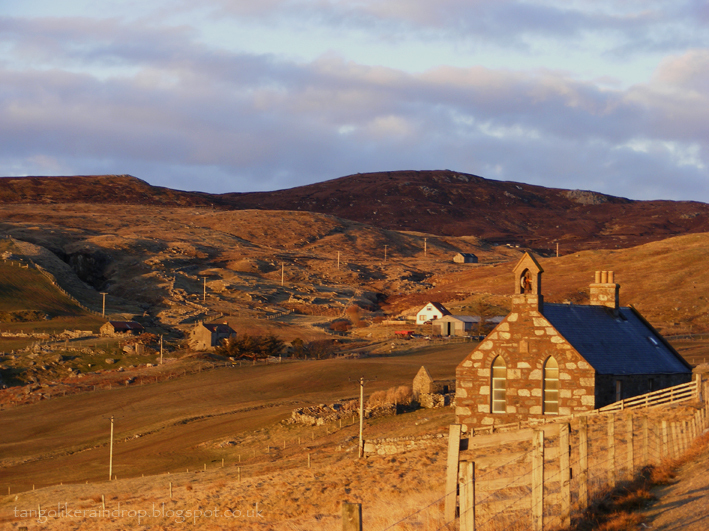 The White Wife hitchhiked all over Shetland gathering car stories from inside cars. The movement director, Janice Parker, spent six weeks visiting a local care home collecting the stories of dementia patients – stories of cars and of dancing. These stories were used as the dialogue in our performance in the car corral (written in grey font above). There was a knitted car, the stories told by the crafters woven into the fabric itself. The knitted car featured in the final performance along with several other vehicles in a car theatre. Audience members got out of their cars after picking up story-telling hitch hikers en route, and entered a vehicle in the car theatre. Each person experienced a different intimate story. 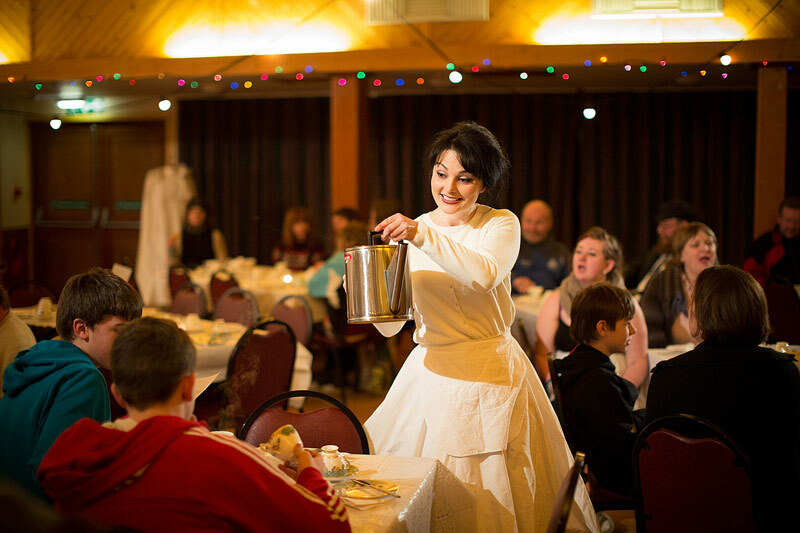 After the car theatre and car corral, audience and cast made their way back to the local hall where the White Wife and choir poured tea and we drank cup after cup while nibbling peerie fancies, singing songs and listening to stories. 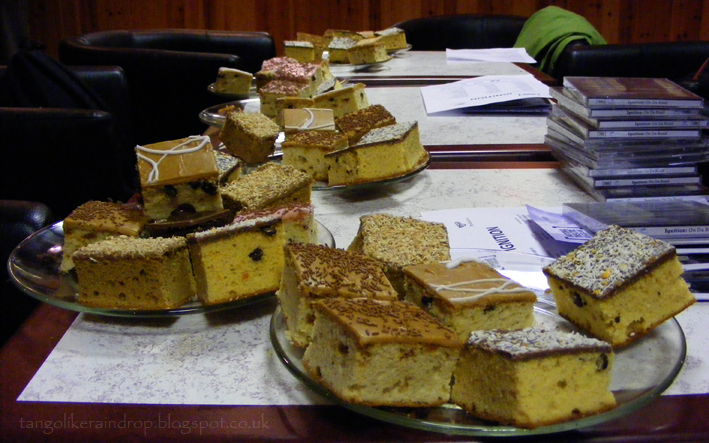 There were three different venues around Shetland and I’ve discovered that in the Yell, the second most northerly isle in the UK, they cut very large fancies! How did I get involved in the project? I’d originally heard of the Ignition project through local social media where people were discussing the sudden appearance of a strange white-clad hitchhiker wandering the roads of Shetland. A friend of mine sent me a link to a casting call on the Shetland Arts website where they were looking for ballroom dancers, amongst other talents. It sounded like an interesting project so I went along to the first meeting in February. I loved the idea of what they were proposing: the mix of cars, parkour, ballroom, music and memories. It took very little convincing to get some other members of my ballroom class involved, and we were off! I’m a bit of a drama queen, I am. I absolutely love costumes and dressing up, but I’m quite shy when it comes to public speaking and being in the limelight. Who would have thought I would have loved being involved with the theatre so much! Every single evening for rehearsals and performances I had the sun on my back as I drove East. With the northern venues I had to drive down my favourite stretch of road: the Aith to Voe road. The last time I drove that stretch for the finale I had to stop and take a photo – it’s just so beautiful. We dancers wore many layers underneath our costumes so we wouldn’t be cold. One the colder of nights I had two pairs of socks, two pairs of tights, a pair of jeans, thermal underwear (top & bottom), a petticoat and calf high boots underneath the dress. I was toasty warm. The other female dancer even tried wrapping herself in cling film! The coldest bit was waiting for our first cue, but once we started dancing we soon warmed up. Most nights it was between -1 to 3 C. We didn’t mind. We drank ginger and lemon tea out of a thermos between sets to warm us. Katie cuts off excess thermal underwear fabric. 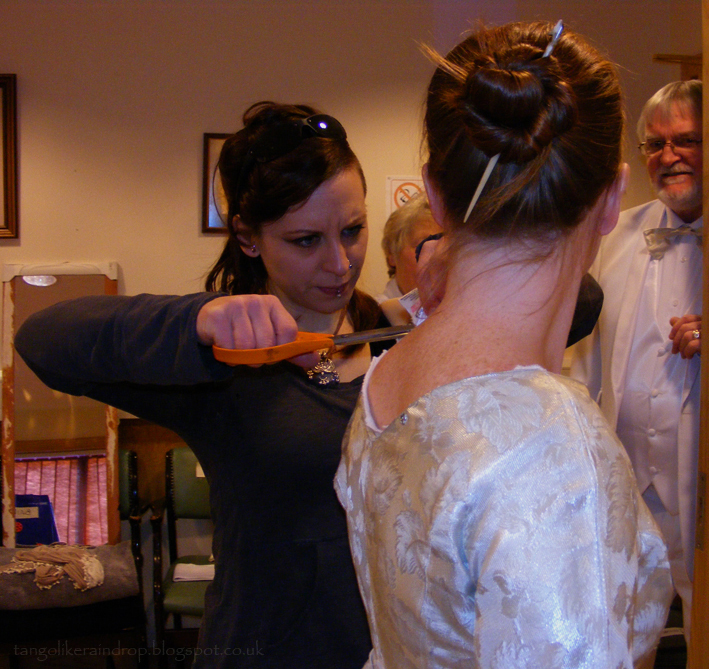 Our fantastic dressmaker, Katie, had to sew me into my costume every evening and then unpick me out of it after each performance. The dress was something else indeed – shimmering silver-white like frosted glass so that we would reflect the video projection as we danced past. We wore long cream gloves, a sash with a bow around our waists and a scarf tied around our neck which rippled in the breeze. The skirts swirled magnificently like a ballroom gown should. I loved swirling in my dress. We had a little delicate silver and pearl brooch pinned to the bodice too and on the final night it was pressed into my hand as a parting gift, a thank you. I will treasure it always, a momento of the time we danced. Part of the ballroom costume was to wear red lipstick. I’m a ginger. I don’t wear red lipstick. I’ve always wanted to, but never had the confidence to. I had to buy some red especially for this and you know, I’ve grown quite accustomed to it! Maybe I should shock the neighbours and start wearing it around the village! Applying red lip liner. A choir singer with a voice like an angel waits in the background. Wonderfully written! I loved reading this. A beautiful, beautiful story, well written & so evocative. Thoroughly enjoyed & green with envy! Beautifully written! Sharing with my CB facebook friends; they love reading about Capers abroad. For a few minutes I was transported to a different world – beautifully written. It sounds like you all had so much fun and I especially love the idea of using cling wrap to keep warm. I might just have to try that if the weather doesn’t improve some time soon. Thank you Angela, for your lovely comment. I don’t know about the cling film idea, to be honest, by my fellow female dancer swore by it! Wow, this is a wonderful story Elizabeth! It took me a few paragraphs to understand it though…jaja. One should do more things this enjoyable. Wonderful Elizabeth, and beautifully written. So evocative of a place I have come to love (via Twitter!). Thanks for sharing it with us, your warmth and enjoyment really shine through. What a wonderful thing! This was not what I expected to be reading this afternoon. Thank you so much for sharing what must have been an incredible experience and a fabulous spectacle.